but that alone is not enough. Bedside lamps in some form for reading by, possibly a floor lamp to sit behind a chair, and task lighting - perhaps a lamp on your dressing table - all have their role to play, too. 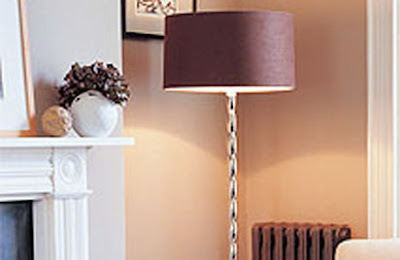 Choosing bedside lights? Don't just stick to table lamps - small pendant shades either side of the bed will free up bedside table space and, because they can be hung so low, create an intimate, cosy atmosphere, too. Another option is to fix lights to the wall, but remember that if you plan to read by them, they need to be just above the height of your head when you're lying down. Dimmer switches are a must for bedrooms. Fit them to the source of your ambient light, whether this comes from an overhead light or a number of wall lights around the room. Don't forget, though, that you need to use low-voltage dimmer switches for any low-voltage fittings. You can't fit a mains voltage dimmer, so it's important to remember to check carefully before you buy. Whether it's a separate home office or simply a corner where you pay the bills and organise your diary, good task lighting is essential. In a separate room, it's worth investing in halogen spot downlighters as well as a good desk lamp, and don't forget, you can use decorative touches, such as clip-on picture lights to show off paintings or notice boards, and even a floor-standing task light to make the room feel less like an office and more like home. For computer work, a desk lamp is ideal but you could also use a floor lamp with a flexible or angle-arm, which will help free up space on the desktop. Low or mains voltage halogen desk lamps are ideal for producing a clean, clear light to work by. If space is tight, clip-on spotlights are useful, and you can move them about the room as you need to. Your light should be able to take a 60-watt bulb at least, as it must be brighter than the others in the room. Place your desk lamp opposite your writing hand or you'll be working in your own shadow. The beam of the light should fall on your working area and not reflect on the computer screen.